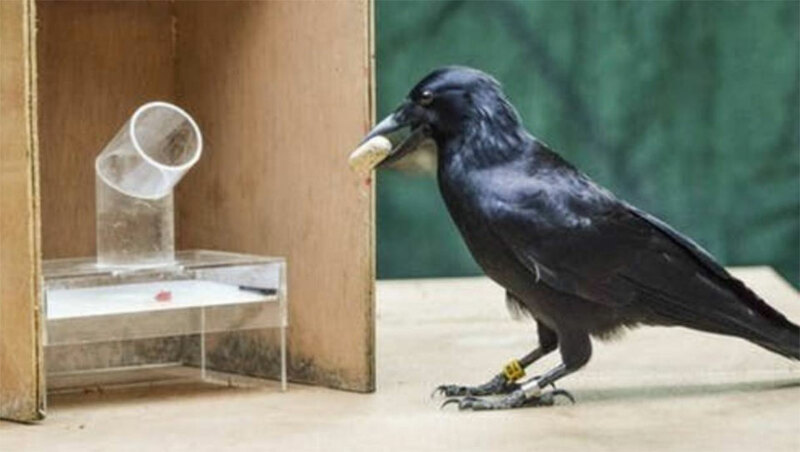 Crows can plan three steps ahead to achieve a goal, in a way that could be similar to how people plan future moves in chess, a study has found. The research, published in the journal Current Biology, produced the first conclusive evidence that birds have the ability to plan while using tools. Researchers from the University of Auckland, the University of Cambridge in the United Kingdom and the Max Planck Institute for the Science of Human History in Germany, worked with New Caledonian crows, a species renowned for its tool-making and problem-solving abilities. "They set up problems to determine if the crows were solving the task on a moment-to-moment basis or were truly planning out a sequence of behaviours before they took on the task," a statement from the University of Auckland said. In one scenario, the birds had to use a short stick to push a stone out of a tube, then drop the stone onto a platform to release a piece of meat. A long stick in a tube was also presented to the crows, but they had to ignore it as it would not help solve the problem. The crows were only able to view one stage of the problem at a time, meaning they had to remember where the sticks, stone and meat were and plan ahead to decide the correct sequence to release the meat. In another scenario, the crows had to use a stone to retrieve a stick, which could be used to release the meat from a tube. A third scenario involved using a stone to get the food directly from the tube, while ignoring two sticks. University of Auckland PhD candidate Romana Gruber said the study showed the birds were capable of pre-planning as each part of the problem was out of sight of the others. "They were imagining the required steps in advance rather than simply acting on a moment-to-moment basis." Dr Alex Taylor from the University of Auckland said the study helped to show how widespread planning with tools was across the animal kingdom. "The ability of humans to plan ahead while using tools is a key reason why we currently have the civilisation we live in today. To see a bird species also possess this combination of abilities is remarkable." In 2011, researchers found New Caledonian crows could understand basic physics. They learnt to drink from a half-filled pitcher by dropping stones into it to raise the water level. The crows quickly began selecting larger stones to fill the pitcher faster. Another study by University of Auckland researchers found kea were also problem-solvers. The cheeky parrots used play behaviours to pick up information about their world and discover potential tools. They could then use that information to solve problems, including retrieving a peanut or pushing a treat through a tube. "Much like human infants, the birds' exploratory personality allows them to gather important information about their physical world," the researchers said.